We took our seats at the bar and and a couple of cold small plates came and went and we were not particularly impressed. These are mostly small dishes you can get in simple Japanese eateries. We're not talking about kaiseke here (though to be fair, they don't advertise themselves as such, next to their name, they write 小料理, or "small dishes"). Then you see that their sashimi pieces are all pre-sliced and you know they can't possibly take their food too seriously. For this kind of price, everything needs to be prepared right in front of you, not pre-cooked, pre-sliced and pre-assembled. And everything that night was pre-cooked, pre-sliced and pre-assembled and just kind of arranged on a plate in front of us. 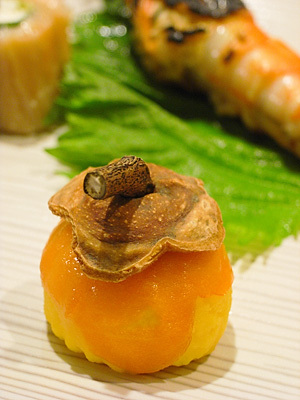 For example, the salmon-wrapped egg yolk pictured above just came out of some storage bin or fridge or something and placed on a plate for us instead of the chef wrapping the salmon around the egg in front of us. Even the rice ball underneath the sushi came pre-balled!!! I was outraged. And by the way, this salmon-and-egg-yolk thing was the most unusual piece of the night (unusual, yes; delicious, no), everything else was extremely ordinary. We were served stuff like tuna sashimi, grilled unagi, katsu and grilled hamachi kama. Again, all stuff you would get at simple Japanese eateries costing a fraction of what they charge here. I was absolutely flabbergasted by their gigantic cohones to serve pre-cooked simple small dishes at a price reserved for kaiseke meals. Nothing tasted particularly awful, per se, but nothing should, at their price and reputation. But the thing is, nothing was good either. It was just a long string of meh. And there appeared to be no rhyme or reason to any of the pairings during each course. At one point, we were presented with a busy plate featuring a slice of duck breast, the salmon-wrapped egg yolk, a horse macherel sushi (with the pre-sliced fish on top of a pre-balled rice *shudders*), a chicken meat ball, a grilled shrimp, a tamago and a cream cheese wrapped with hamachi sashimi garnished with caviar. Aside from the fact that they were all cold and prepared ahead of time, there was nothing about them visually, texturally or flavor-wise that they should be presented and eaten together.